Are the Austrian FPÖ party really neo-Nazis? At an FPÖ rally, I mix with those who are both for and vehemently against the controversial party. FPÖ are compared to Nazis, one man says, because the FPÖ is an identity cult which exists only through the leader: “Strache is the FPÖ”. If Heinz-Christian Strache is nervous, he doesn’t show it. On stage in front of what he later claimed was a crowd of 15 000 people, he is dressed stylishly and speaks with easy authority. Two days before the Austrian national legislative elections, Strache’s speech is the main event at the grand finale of his party’s so-called Nächstenliebe-Tour (Neighbourly Love Tour) at Stefansplatz in Vienna. All eyes are on him. Strache has been leader of the Austrian Freedom Party (FPÖ) since 2005, and by anyone’s estimations, he is doing a good job. Since then, the FPÖ has been the only party to have seen consistent gains in elections, and two days after his speech at Stefansplatz, Strache’s wish for a "Blue Wonder" was granted. The party won 20.5 per cent of the vote – an increase of three per cent on 2008, with significant gains among younger people and blue-collar workers. The FPÖ is now the strongest it’s been since its record result in 1999. But at the rally, Strache’s popularity doesn’t stretch past the police barricades. Beyond, chants ring out from a demonstration against him and the FPÖ: “Niemand vermisstdich” (Get out – no one will miss you) and “Nieder mit der FPÖ” (Down with the FPÖ). Banners reading "Nazis Raus" (Nazis Out) and "Den Rechten die Zähne zeigen" (Bare your teeth to the Right) can be seen. An amused American tourist asks which side is Nazi and which side is anti-Nazi. An elderly Austrian tells him that no-one here is a Nazi. Though the rising electoral success and the slick, professional set-up bring some legitimacy to the proceedings, it’s hard to avoid the simple truth – Strache’s FPÖ is an infamous far-right party, preaching aggressively populist nationalism and reactionary rhetoric which often encompasses racism, xenophobia, anti-Semitism, and Islamophobia. Despite a rough few years for the party in the 2000s, the recent election results show that it is now back in business. What’s more, if support for the two main parties – the Austrian Social Democrats (SPÖ) and the Austrian People’s Party (ÖVP) – continue to decline as they have of late, there is no reason why the FPÖ couldn’t come second, or even first place at the next election. In a country still sensitive about World War II and the Holocaust, Haider had become notorious for misjudged comments praising Nazi employment policies and the Waffen-SS. But he was also acknowledged as a brilliant politician. The FPÖ was in the midst of an existential crisis when Haider became leader in 1986. His charm, charisma, controversy, and willingness to say what other people were allegedly thinking electrified the staid Austrian political arena. Haider insisted on pursuing vote-maximising issues like nationalism and immigration, which found huge support among many blue collar so-called ‘modernization losers’, and consistently increased the party’s share of the vote in four out of five national legislative elections. In fact, as the FPÖ moved further right it became more, not less mainstream. In the 1999 national legislative elections the FPÖwon 26.9 per cent – enough to negotiate a coalition deal with the ÖVP despite the SPÖ having won overall. For allowing the far-right into government, Austria drew diplomatic sanctions from the EU – at the time, the only member state to have ever been hit with such measures. But the coalition was ultimately doomed to failure. In government, the FPÖ didn’t introduce a policy of staunch Nazism. They actually found it difficult to maintain their populist, anti-establishment stance, and had no choice but to be associated with widely criticized legislation. Popular support declined, and in 2002 competing factions of the party – office-seeking and policy-seeking; nationalist and libertarian – culminated in the ‘Knittelfeld Putsch’, where an accord between Haider and the party chair Susanne Riess-Passer was torn up. A number of prominent politicians subsequently left the party, forcing an early election. Following the vote, the coalition with the ÖVP was reinstated, but the FPÖ’s support had dropped to just 10 per cent. Party in-fighting continued, and in 2004 Haider left to form a new party – the Alliance for the Future of Austria (BZÖ) which he remained affiliated with until his death. After Haider’s defection, the FPÖ was a fractious mess. For months its members couldn’t settle on one leader, but in 2005, Heinz-Christian Strache finally brought stability to the party, and not a little of Haider’s charm. At just 14 years old, Yaruma and Julie have lost all hope. They are standing outside the Opera as an anti-FPÖ demonstration gathers. They are outraged that so many Austrians are ignorant and hate-filled enough to support the FPÖ. I ask what they would say to someone who believes that immigrants are a strain on the welfare state. “The population of Austria is getting lower,” says Yaruma. “Without immigrants the system would fail.” She asks why a country should be exclusively kept for one nationality. We’re all humans in the end, she says. Laura and Viktoria are sitting on a wall nearby. They tell me that they believe the FPÖ are “nothing other than Nazis”. I ask whether branding the FPÖ as Nazis doesn’t trivialise the seriousness of the word, and ignore its specific historical context. They explain that Strache is a member of a secretive neo-Nazi fraternity called the ‘Burschenschafter’. This group holds gatherings each year in the Opera, and is infamous for publically mourning the deaths of prominent Nazi figures as well as commiserating over the German loss of World War Two. A guy called Matthew joins the discussion and says that although he would not necessarily claim that the FPÖ are Nazis in the traditional sense of the word, “they still share a lot of values with the National Socialist movement of the 30s”. He says, by way of explanation, that Strache’s appeal is based largely on charisma, attacking the incompetence of the opposition, and posing as a crusader for working class people – all typical approaches of vote-seeking, populist, potentially fascist or Nazi leaders. Michael and Iris tell me that the FPÖ are compared to Nazis because the FPÖ is an identity cult which exists only through the leader: “Strache is the FPÖ.” This worries Michael not only because the FPÖ has a brilliant propaganda machine and a knack for very successful PR stunts, it also gives dangerously easy answers to angry, disillusioned people. This can often incite racial hatred. If there are laws against this in Austria, they are not being enforced when Strache claims any number of inflammatory and misleading things, including that the only way to get your family into social housing is to wear a headscarf. The march sets off through the historic Innere Stadt district. We are heading towards the grand finale of the FPÖ’s Nächstenliebe-Tour but are stopped at Graben, just short of Stefansplatz. The square is decorated with arches of blue balloons and police have blocked off most of the route. They are still letting people through, but only in ones and twos. Reams of confused tourists gawp and take photos. I push my way into the FPÖ rally, where the demographic changes dramatically. There are far more people over 50 – many wearing dirndls and lederhosen. I’m surprised to see a number of non-white people proudly sporting FPÖ neckerchiefs which read ‘Aus Liebe zur Heimat’ (Out of love for our home). Perhaps ‘Heimat’ is no longer an exclusivist concept where membership of the nation is based on blood, culture, and race? Perhaps it is now open to anyone willing to accept the nation’s language and values? 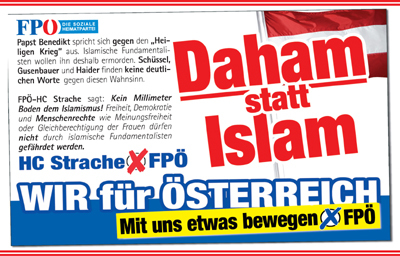 Given some of the FPÖ’s ultra-xenophobic campaign posters though, I’m not so sure about this. Nightmarish electro-schlager is being blasted out from the stage by a band also dressed in lederhosen. Everyone jigs along with no regard for the rhythm. The crowd is vast, spilling right across the square. Above, the gothic spires of Stefansdom loom jaggedly in the darkening sky. It’s getting cold. A pretty young host announces a live performance by the singer Werner Otti, a finalist from the TV talent show ‘Die Grosse Chance’. His song, ‘Liebe ist der Weg’ – a contrived power rock ballad – was written especially for Strache’s campaign, complete with lyrics glorifying him as the guardian of truth, justice, and freedom. I overhear a heated discussion nearby. Two older men are confronting four young people. They’re arguing about immigration. One of the older men is telling them why it’s bad for Austria. A young guy asks whether the older man believes in equal rights for all humans. “Sure,” he replies. “But these immigrants won’t integrate.” The younger guy denies this is the case. They back-and-forth angrily, then the older man waves his hand dismissively and strides off with his friend. Finally Strache takes to the bright lights of the stage, greeted by huge cheers and applause. People sound horns and raise their neckerchiefs into the air. The atmosphere borders on hysteria. Are the FPÖ really Nazis? Are they a racist far-right party like the BNP or the French Front National? Or are they just cynical opportunists using aggressive populism to keep up their poll ratings? Listening to Strache, it is strange to think that Austria was ever a country free of the association with Nazi mass murder and totalitarianism it must live with today. Nonetheless, despite its gains, the FPÖ is not in a good position to negotiate a coalition. Though many FPÖ voters were defectors from the SPÖ and the ÖVP, Strache hasn’t yet managed to convince enough Austrians that their country is really in need of as much change as he claims. However, if the Eurozone crisis were to worsen, or the eventual governing coalition offered the same political gridlock as has characterized the past five years, Strache’s moment will come. And he is very well prepared for it.